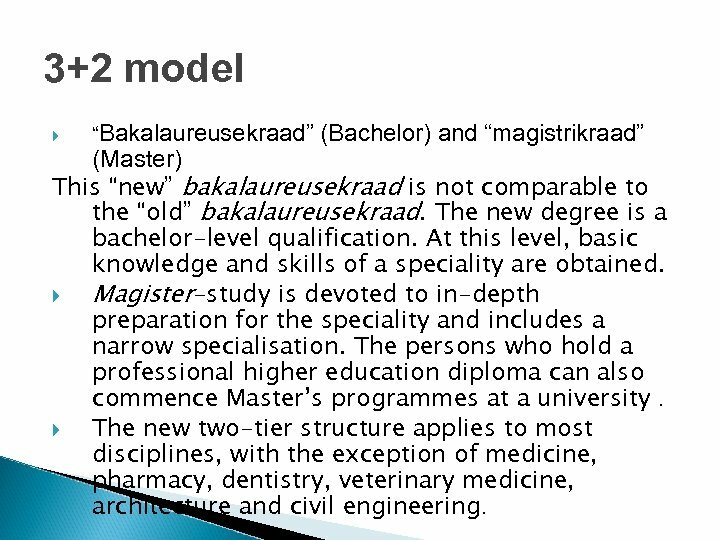 3+2 model “Bakalaureusekraad” (Bachelor) and “magistrikraad” (Master) This “new” bakalaureusekraad is not comparable to the “old” bakalaureusekraad. The new degree is a bachelor-level qualification. 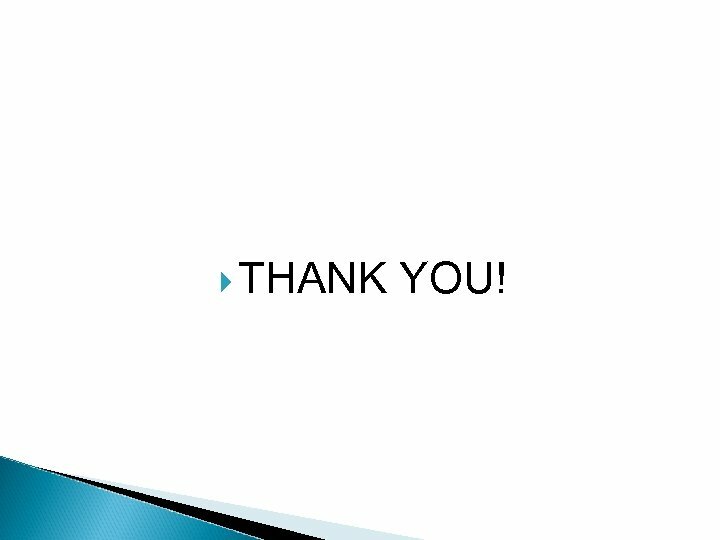 At this level, basic knowledge and skills of a speciality are obtained. 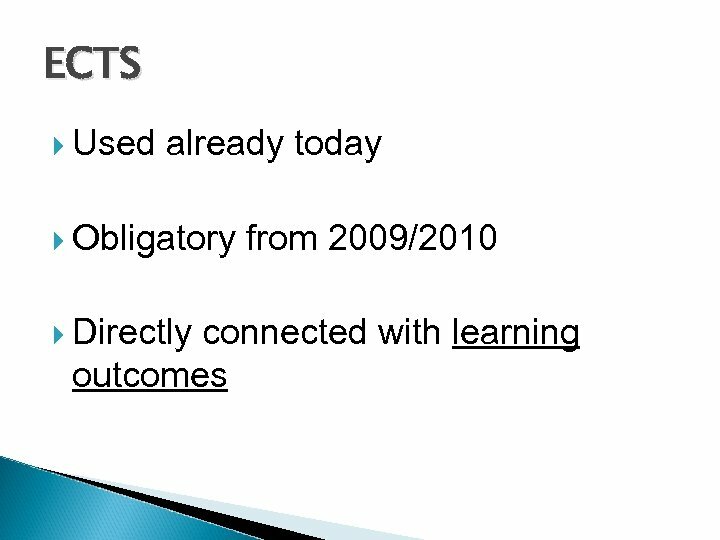 Magister-study is devoted to in-depth preparation for the speciality and includes a narrow specialisation. 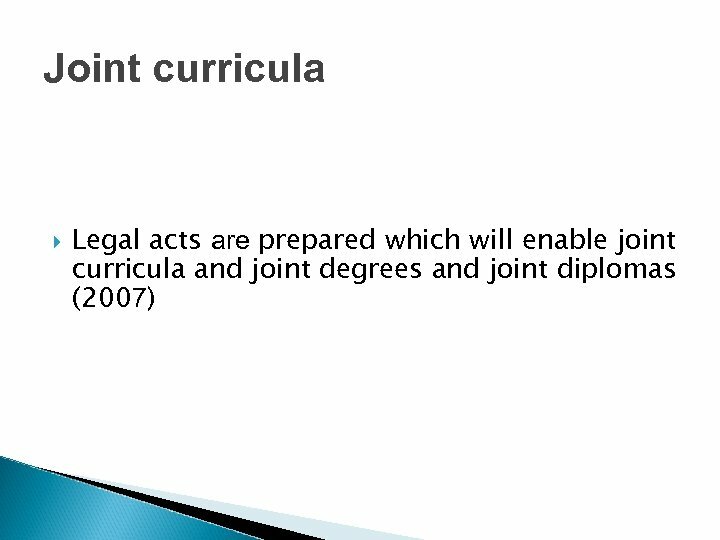 The persons who hold a professional higher education diploma can also commence Master’s programmes at a university. The new two-tier structure applies to most disciplines, with the exception of medicine, pharmacy, dentistry, veterinary medicine, architecture and civil engineering. Higher education strategy 20062015 Aims of interationalisation: The national strategy comprising internationalisation of Estonian higher education shall be developed and implemented which foresees bringing of highly qualified specialists (teaching staff, top specialists in particular professions) to Estonia, supporting the mobility of our teaching staff and students, starting up study programmes that have been developed in cooperation with foreign higher education institutions, supporting studies of foreign students in Estonia. Widening multilingual Doctoral studies and participation of Estonian Doctoral students in international networks of Doctoral studies. A scheme will be initiated whereby every Doctoral student defending a degree at an Estonian university must learn/work abroad for up to one semester. 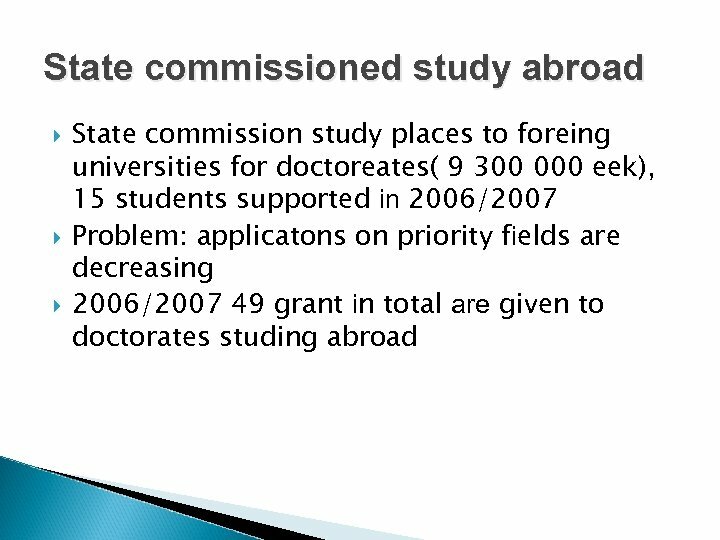 The cost for the Doctoral student to study for a short period abroad will be covered for the universities from the resources allocated to Doctoral studies. Bringing foreign Doctoral students to Estonia will be supported, opening SCE student places to foreigners on the same basis as for Estonian residents. 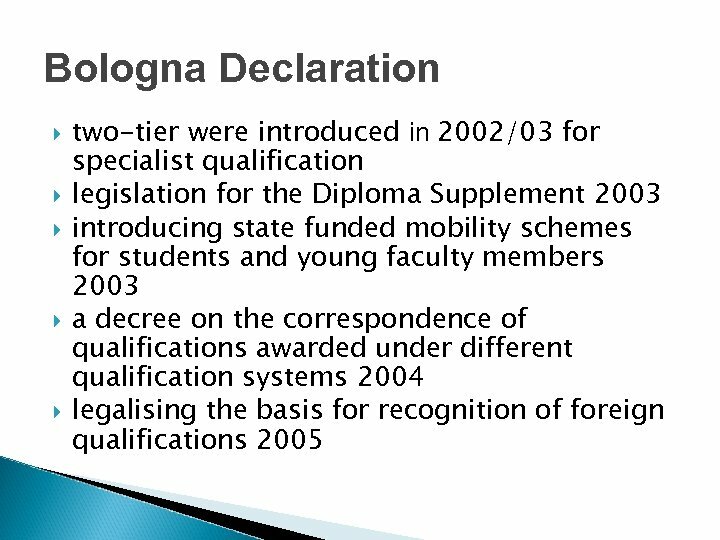 The system of Post Doctoral Studies will be implemented which is also open foreigners. 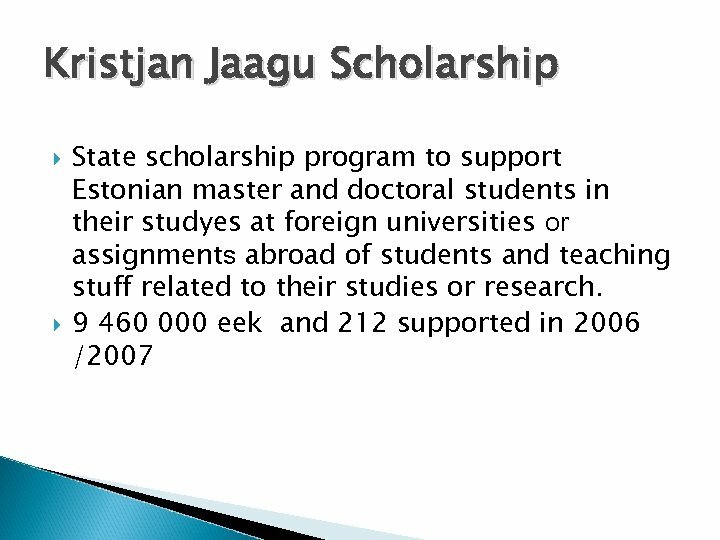 The results and effect of the Kristjan Jaagu scholarship programme will be analysed and the prospective volume and organisational scheme will be developed for the programme. Indicators of strategy proportion of permanent teaching staff positions to foreigners by 2015, at least 10 % proportion of foreign Doctoral students and post-doctoral students in Estonian universities by 2015, at least 3 % number of foreign students by 2015 – 2, 000, including the EU mobility programmes, number of full-time foreign students studying in Estonian higher education institutions by 2015, at least 2, 000 proportion of joint curricula. 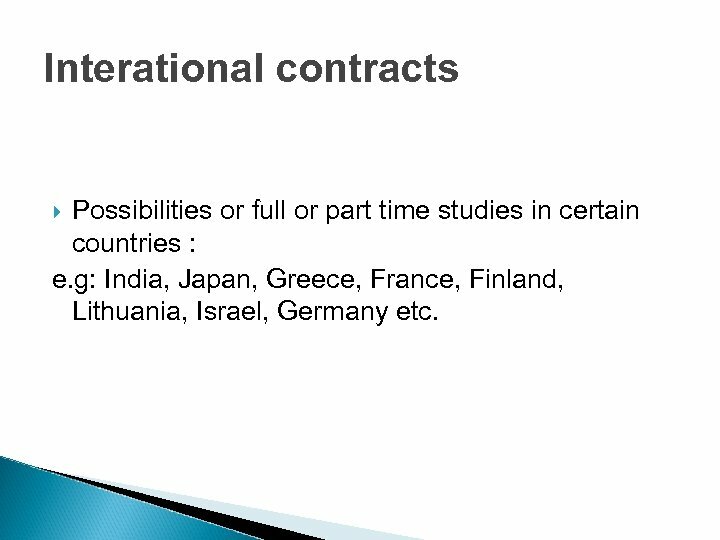 Interational contracts Possibilities or full or part time studies in certain countries : e. g: India, Japan, Greece, France, Finland, Lithuania, Israel, Germany etc. Scholarships for Ph. 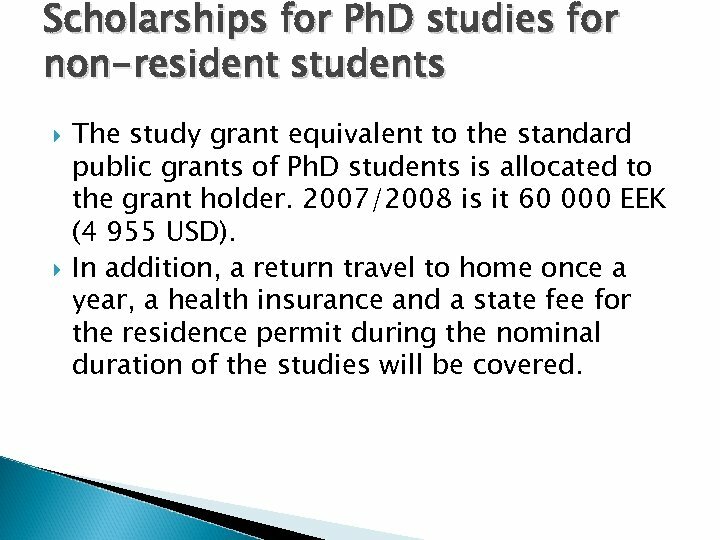 D studies for non-resident students The study grant equivalent to the standard public grants of Ph. D students is allocated to the grant holder. 2007/2008 is it 60 000 EEK (4 955 USD). In addition, a return travel to home once a year, a health insurance and a state fee for the residence permit during the nominal duration of the studies will be covered. Some more. . . Using ESF possibilities to atract foreign doctorates and support the return of estonian researchers living abroad Participation in Erasmus, Tempus and Erasmus Mundus programmes Nord Plus inisiatives ETC. . . .